By building a stellar reputation for accuracy within the automobile and aviation circles, they became a staple within that crowd by the 1960s and continued to accelerate. 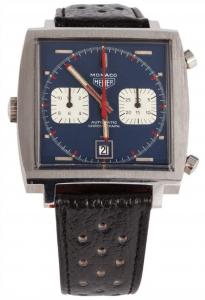 Heuer became a leading producer of timing equipment and stopwatches because of this and has strong associations with race car heavyweights such as Jo Siffert, Niki Lauda, and actor Steve McQueen. 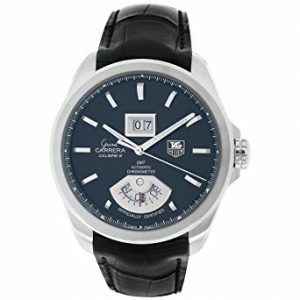 After being bought by manufacturing giant Techniques d’Avant Garde or TAG, a new company was born named TAG Heuer in 1985. The conglomerate continued to push their presence in the market, becoming known as one of the best global luxury wristwatch makers around. Their positive market presence was enough to get the attention of Louis Vuitton Moët Hennessy (LVMH) that they bought TAG Heuer and brought it under their umbrella in 1999 to solidify their presence in the luxury goods space. 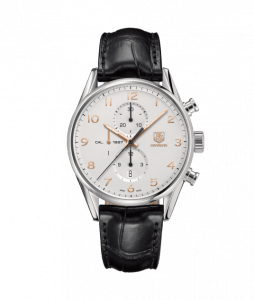 TAG Heuer create innovative timepieces that can accommodate various price brackets and here’s a list of just some of what they have to offer. First up is a great example of the Formula 1 line. 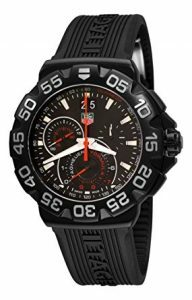 This is the entry-level foray into TAG Heuer and for anyone looking for a daily watch that can take a beating. 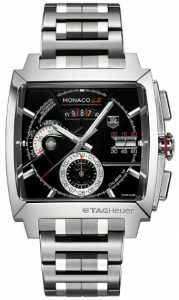 The Formula 1 is inspired by TAG Heuer’s lengthy participation in the sport bearing the same name. Currently proud supporters of the Red Bull Racing team, TAG Heuer always had checkered blood running through their veins and this lineup is just acknowledgment of their dedication to the sport. 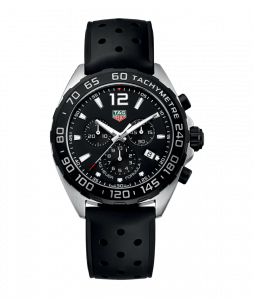 The Formula 1 line has a quartz movement but still offers the functionality that TAG Heuer is known for. It has chronograph functionality, tachymeter measurement, and a date dial. It’s not as complex as the other models in their lineup, but it’s a great way to get into the luxury market without getting a second loan for it. Complete with a perforated leather band, this particular model would look great with a weekend attire accompanied with a spirited drive to your favorite piece of road. With an all-black motif with silver accents, it has a modern design to it and there’s nothing conservative about this design. It looks as sleek as the cars it’s driven with. Our next example is the same Formula 1 line but called the Formula 1 Grande. It has a bigger case at 44m and has a stronger, more scratch-resistant PVD stainless steel case. It also has a rubber strap, which makes it more suitable for water-related activities, which solidifies why the Formula 1 is a great contender for a daily watch. The Grande is a stepped-up version and the selection of materials, the design placement, and overall presence is similar to a man wearing a well-tailored suit. The finer details elevate the overall product to levels typically unreachable before. It’s hard to explain, but there’s something about the type of materials chosen that elevates a product to another level. A prominent feature is the Grande date window at 12 o’clock, which is starkly different in design than the other Formula 1. Complete the package with a sapphire crystal and a titanium-carbide coated bezel and this is a hyped up version of the Formula 1. If you’re looking for more ruggedness in your watches, this might be the one. Classy watch with a stellar automatic movement for a great price. As we step up another level, we enter the main Carrera model range. This is the next level of watches for TAG Heuer, where they elevate designs by adding more traditional components such as an automatic movement and present a more conservative design, aimed at a dressier appearance overall. 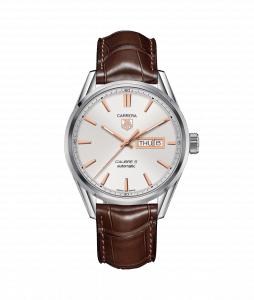 The Carrera we’ve chosen is a silver motif with gold accents accompanied by a brown leather strap. At 41mm, it’s not a big piece to occupy wrist space but the white contrast face will add more depth than watches that have a dark motif. This has a classic design and quite timeless, which will greatly accompany you to an important function. The automatic movement is a great addition to any watch enthusiast and TAG Heuer has a great reputation for accuracy. The Calibre 5 movement is their main-stay movement that’s award-winning with a power reserve of 38 hours at 28,880 vibrations per hour. It’s the BMW 3 series or the Mercedes C-Class of wrist watches and you can’t go wrong with that. The exhibition back adds a lovely view into your hard-earned reward and get to see the Calibre 5 in full glory. Complete with a deployment clasp bracelet, it adds sophistication to anyone wearing this piece. We personally love the classic good looks but we at Gracious Watch love to be a little more over-the-top and some of our later examples will definitely blow you away. Reliable quartz diver watch with bright dials and legible face. 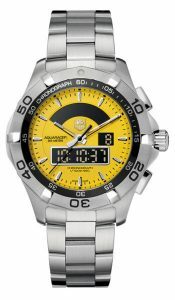 The Aquaracer 2000 is a no-frills, strictly game-day, built-to-last divers watch. Strictly function over form, the Aquaracer is not the watch you’d wear to a dinner party with a suit, but if you can pull it off, you don’t need help from us! The design, with the bright yellow dial, to the chunky bezel, and the digital functions display prominent in the watch, the diver will be fully knowledgeable of anything he/she needs from dive time to various chronograph capabilities. At 43mm, the Aquaracer 2000 is not a big watch but will provide you enough visibility and legibility to do everything you need the watch to do for you. With a scratch-resistant sapphire crystal, you don’t have to worry about not being able to see specifics because there’s a big gash running across the crystal and has a stable, reliable quartz movement for consistency when diving. The 300m water resistance is an added plus, which will be exponentially useful if you’re diving 30m for an hour or so. Divers need their watches to be dependable as their lives may depend on it, and the Aquaracer 2000 is more than able to do the job. The design is different, purely focused on timing with the second markers taking over the watch face. 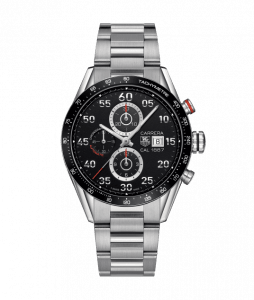 As we go back with the Carrera model line, we have a chronograph offering designed for someone who needs to worry about the last possible minute. 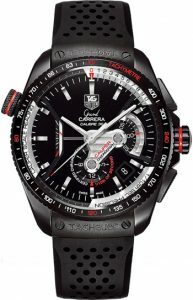 With a track focused motif, this particular Carrera has a great steel case and a ceramic bezel with a tachymeter scale. In order to get proper lap times, you need a dependable timer and this Carrera has the first in-house movement TAG Heuer created with the Calibre 1887. This automatic, Swiss-made movement is 39 jeweled with a 50-hour power reserve. It is poised, balanced, and ready to shred asphalt. The split time windows in 6, 9, and 12 o’clock add more variety in what could have been a very basic watch. The design looks composed and ready to be used for Le Mans, or maybe your best lap time on the running track. The ceramic bezel adds a nice frame on the 43mm watch and the contrasting markers make it easier to read and calculate speed. Either way, the Carrera Chronograph with the Calibre 1887 movement will be a great addition to your collection. When you want to be technologically advanced with a fully customizable TAG smartwatch. With ‘titanium’ as a key ingredient in this modern masterpiece, durability and wearability are key to this watch. 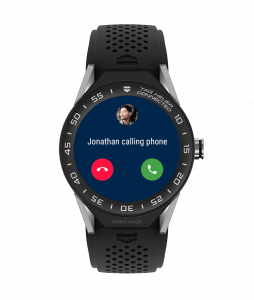 Powered by Intel with GPS functionality for mapping/tracking, Near-Field Communication for one-tap payment capabilities, accelerometer, gyroscope, tilt detection sensor for motion-related activities, and a microphone. It will definitely put the Apple Watch a run for its money. It’s also compatible with both Android or iOS users so it has more reach in the marketplace. With Bluetooth and WiFI connectivity to boot, this smartwatch will keep any user up-to-date with what’s important: cat memes. A retro blast from the past example. Various greats have held the Autavia with the most famous being racing legend Jo Siffert. He always wore the Autavia because he liked the functionality and how it looked, and not because he was sponsored by Heuer. It was a genuine reaction to a stellar product, and that’s what you need from a loyal customer. A flagship brand of Heuer at the time, the Autavia (a portmanteau of Auto and Aviation) propelled the brand to notoriety and gained popularity amongst the racing crowd. The Autavia has a rotating bezel, which gives you the ability to track time in various ways. This Autavia is the original black dial, while the Siffert version is a rare version with a white dial. Nonetheless, it still looks just as good as the original, oozing a vintage vibe without the vintage watch pains. Owning a vintage watch has its ups and downs, with mostly downs, because parts are becoming more scarce. Do you know how hard it is to find parts for a Calibre 11 movement? I sure do. It pains me a lot whenever something breaks in a vintage watch and it’s so high-maintenance. A reboot version of the original gives you a balance of the stellar good looks you look for in a vintage watch, without the pains of owning a vintage watch. It’s a good compromise, don’t you think? A dressier example of the Carrera Cal 1887 example we saw earlier. If you happen to like the Carrera we saw earlier, but you found it too flashy, well this iteration of the Calibre 1887 chronograph may tickle your fancy. With the same dimensions at 41mm, it’s the same offering but in a more formal package. First, it has an all-steel case with no rotating bezel involved. Instead of minute markers, it has hour markers as a traditional watch and has a white and gold motif to give it more a more dignified look. With this new configuration, it gives the wearer a less ‘boy racer’ look and a more mature design. 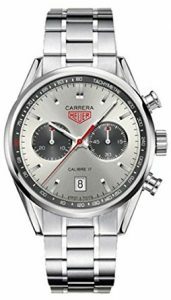 This particular Carrera is more dignified compared to the motocross-themed CAR2A10.BA0799 and would be focused on the executive wearer. While we could argue what is considered to be ‘dressy’ or proper’, The CAR2012.FC6235 would be a great low-key piece that you can add to your collection if you ever need a dress watch and love chronograph functionality. The same legendary Calibre 1887 movement still runs the joint on this Carrera and will be providing you with many years of reliable service in an elegant package. GMT functionality with a classic design? Sign us up! In our GMT model, the GMT time is on a rotating disc, providing the wearer a unique way to get two distinct time zones. With a grand date window at 12 o’clock, it’s the little things when combined makes something great even more spectacular. At 42mm, it’s the right size and all-steel accents in front of a blue watch face adds a dignified presence in the design. The simplistic yet feature-rich example of the Grand Carrera justifies the increased step in pricing. We like this for what it offers. Flyback chronographs are unique and a horological feat. Respect it. 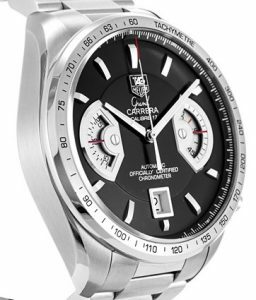 A unique feature is offered in the Carrera line is the flyback chronograph. A 31 jeweled movement, the Calibre 36 movement that’s running this flyback chronograph is designed like the Grand Carrera with the Striped Geneva finish in the back to add a touch of sophistication to the piece. A typical chronograph requires the user to stop the timer once it started to reset it. A flyback is unique where the timer can reset while it’s active. This is critical for certain careers such as aviation. You can calculate average speed immediately by using waypoints and a flyback chronograph as the requirement of stopping then resetting is null and void. This improvement on design increases efficiency for the wearer and adds more functionality to an already capable piece. The design pays homage to the classic stopwatch that Heuer was known for, putting the focus on seconds rather than hours or minutes, which has a 60-second scale surrounding the split time indicators. 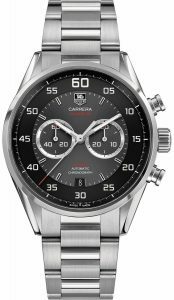 With a contrasting two-tone face design, the Carrera Calibre 36 is designed for people on-the-go and need an efficient way to use a chronograph. They are available in either stainless steel or titanium with a carbide coating for more durability. The contrasting outer ring puts focus on the inner parts of the watch, which is focused on chronograph usage rather than just timekeeping and we are fans of design with a purpose. Nothing drives us nuts more than design for design’s sake. Dual rotating discs on a chronograph adds differentiation to measure and read time. A good way of elevating a chronograph with an industrial flair. Another delicious example from Grand Carrera is a Caliber 17 RS. ‘RS’, which stands for ‘Rotating System’ are the two prominent discs that show minute and hour elapsed for the chronograph functionality. Rotating discs are a very different way of presenting time and a modern way of doing things instead of an analog hand indicator. We like how it has a brute look with the all-steel construction, futuristic disc layout, and a black watch face within 43mm. It’s a very masculine watch if we do say so ourselves. Feature-wise, it’s your typical chronograph with a stainless steel case/bezel with a tachymeter built-in, so nothing to write home about but you’d normally be attracted to this GC because of how it’s been laid out. 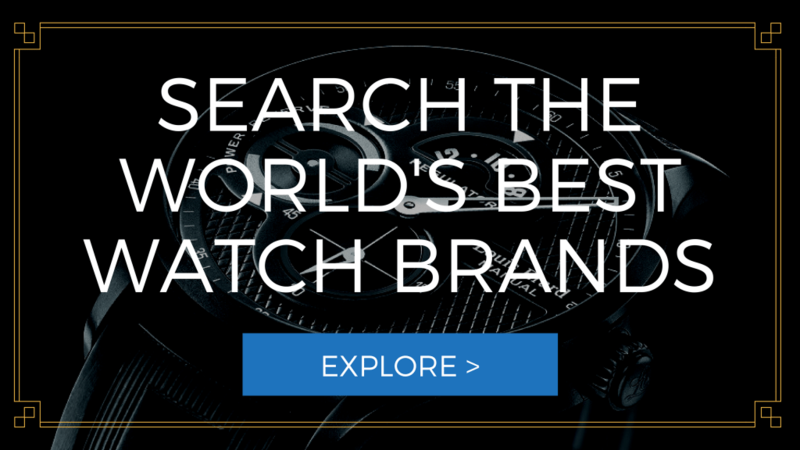 It’s different, unique, and unlike any offering of chronograph out there in the market today so if you’re looking to stand out from the crowd, this could be the one for you. A complex and feature-rich timepiece in the iconic Monaco shape. Inspired by the award-winning Monaco Calibre 360 Concept, the LS chronograph gives the wearer a unique experience of timekeeping that is rarely replicated. A 41mm square piece, the LS is a futuristic take on timekeeping displays and chronograph functionality, in general. With a rotating disc for the date display at 12 o’clock, it’s no longer a window but a crescent glimpse of the world around you. At 3 o’clock, we have the linear second indicator, which is a unique way of tracking seconds and very futuristic. The chronograph has three sub-dials displaying: seconds, 60 minute at 9 o’clock and the 12-hour indicator at 6 o’clock. While intimidating at first, once you get used to using the functionality and the display that it has, it’s a great piece to own. With an all stainless-steel construction, the LS chronograph is an offering of what TAG Heuer has in store for the future and what happens when great minds push themselves beyond their boundaries to try something different. This design philosophy may not attract most but it’s all about stepping up from what’s normal and creating uniqueness and a timeless design overall. 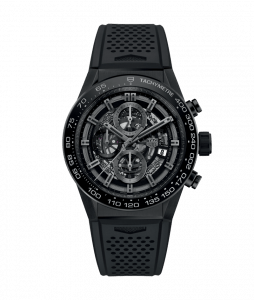 A dark, stealthy example of TAG Heuer watches with a skeleton feature. The Heuer 01 leaves nothing to the imagination with a full skeleton watch. Complete with an all-black motif with gray contrasts, it is low-key and nondescript as most watches but let the finer details speak to you. First, they focused on the material construction with a black ceramic construction. The black ceramic coating with titanium added into the equation provides great strength and scratch resistance to the all-black finish. This is a nice-to-have because nothing bugs someone more than a nick or a tiny scratch on an all-black watch. Complete with a sapphire crystal and a titanium-carbide coated steel case, and this watch can last you a lifetime. With the Calibre Heuer 01 movement, it’s a 39 jeweled movement that will provide 50 hours of uninterrupted power and the skeleton date dial is a nice touch to the construction overall. It’s only visible when the date crosses the white date window and doesn’t distract the wearer from the overall construction as it follows the same motif throughout. This is just an elegant, ceramic-coated watch that needs your attention. To celebrate his 80th birthday, TAG Heuer presented the great-grandson of the founder, Jack Heuer, with a limited edition of the Carrera. Since running the show as CEO of Heuer during the 70s, he led the company to greatness providing the wristwatch market with accurate timepieces that were beloved by the masses. The same dedication to detail and perfection is a reflection of the limited edition watch as it pays homage to the original Carrera of the 1960s. You can see that it bears the classic ‘Heuer’ logo with no TAG Heuer visible in the front. It also has a unique star-burst finish where, depending on where the light hits it, can be silver to gray to white. The subdials are contrasting black and shows the running seconds and a 30 minute counter. With a contrasting red chrono-hand for the chronograph definitely pops out against the silver finish. Something unique is in the tachymeter bezel, the number ‘80’ is highlighted red, to acknowledge his birthday. That’s a nice touch. 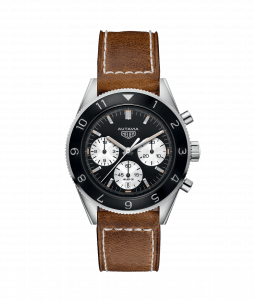 The watch overall is a very beautiful Heuer watch and well deserves to honor‘ Jack Heuer’s 80th birthday. For all intents and purposes, this would be perfect for someone’s birthday gift as well. My birthday is around the corner and this one favorite of mine since it was released back in 2012. The Carrera that pays tribute to what brought them to greatness needs to be respected, and whoever has the luxury to own this piece should treat it like a legend. A built-in caliper to measure time to 1/10th of a second. Now that’s impressive. So you’re probably wondering what a caliper chronograph is. This particular piece gives you the ability to measure the lap time or whatever time you were measuring down to 1/10th of a second through the usage of a caliper. So try to think about this watch having two bezels. One is the rotating bezel with the tachymeter, which most chronograph watches already have but on the inside, there’s a crown you can twist and move a caliper scale around to line up markings and calculate the last 1/10th second! How awesome is that?! 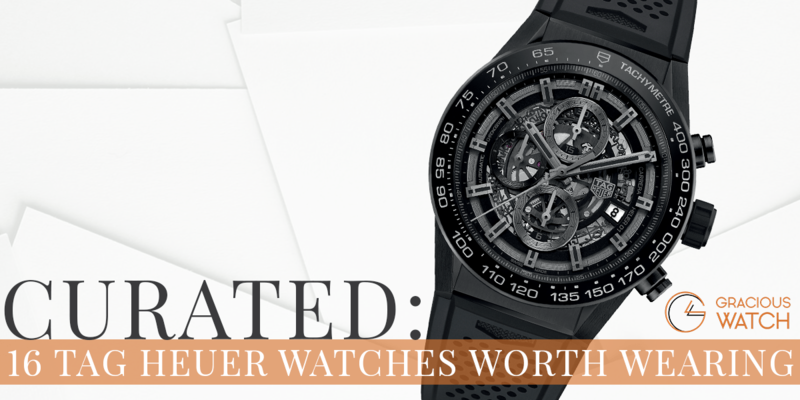 If sheer detailing to accuracy is your cup of tea, then this watch is for you. Beyond that unique feature, it offers you a 43mm wrist presence, options for steel with a rubber band or a black PVD titanium with black leather or rubber, and water resistance to 100m. Once again, this particular example shows my Grand Carrera watches offer more value for the money because of the extra features it offers a wearer, which could be critical in their day-to-day tasks, whatever that may be. Value is dependent on your requirements so while this may be laughable to most, it’s the world to that one person. Is that person you? Let us know in the comments section. Because Steve McQueen, the epitome of coolness, had one. Enough said. So why should you care about this watch? Well, if you don’t know who Steve McQueen is, you need to finish reading this, look him up, and watch Le Mans after. He oozes charisma in both silver screen and real life. He was also an avid car enthusiast, owning various exotic cars such as an original Ford GT40 and the Mustang GT he made famous in Bullit. Always addicted to speed, he was fitting in the 70’s movie Le Mans, where he played race car driver Michael Delaney in 24 Hours of Le Mans. It was a masterpiece of why race car drivers dedicate their life to the sport and accepting risks involved with it. In the movie, he’s seen sporting a Heuer Monaco Calibre 11, which was the first water-resistant piece with a square case and the first automatic chronograph. The watch alongside the Heuer logo present in his jumpsuit brought the company into the limelight and changed Heuer’s path to the future. This association of Heuer with the King of Cool has been cemented since and whenever someone thinks about a Heuer Monaco, they think of Steve McQueen. These are rare pieces nowadays and Calibre 11 maintenance is arduous, to say the least. But what’s pain, compared to knowing you have an icon in your collection? Priceless.